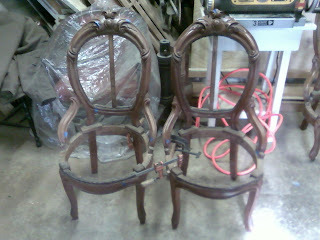 The next step in the process of restoring these chairs was to make all of the repairs to the frames. 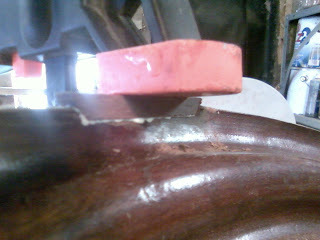 Most of this involved fine tuning repairs made previously by another restorer. 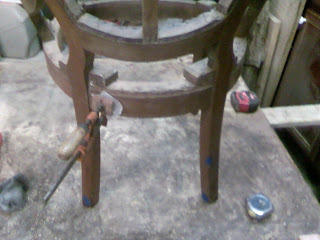 In addition there were many cosmetic repairs to make and also loose veneer to glue down. I also included some photos of a small patch put in on the settee. Below are photos of all of these repairs. 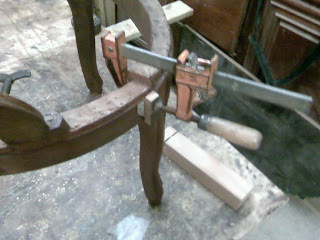 Gluing down loose veneer on the seat frame. These two chairs are having loose veneer glue down. 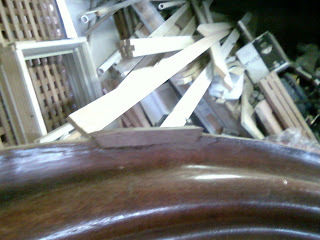 If you look closely you can see little pieces of blue masking tape on each chair. 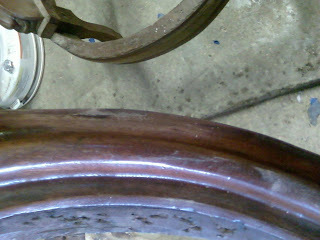 Each piece of tape marks a place where the chairs need cosmetic repair. 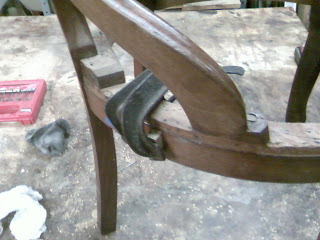 Gluing a patch in place on the settee. The patch once it had dried in place. A photo of the patch after it has been carved and sanded.